Volkswagen has somehow kept the general look of these rounded, bubbly cars throughout the decades. There’s no mistaking the classic “bug like” shape unique to VW. 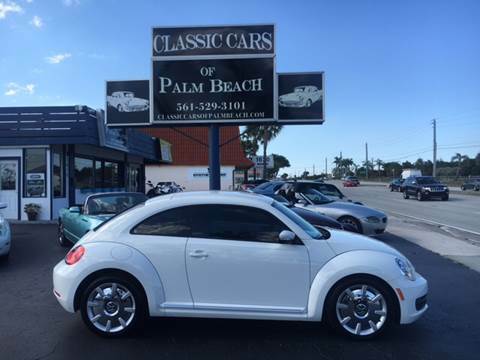 2012 VW Beetle in Jupiter, Fl. This particular car has a very appealing interior ( pictures above next to the ’72 .) The white dash carries throughout the door sills and to the back interior of the car, punctuated with a splash of white on the steering wheel. The trim on the seats, almost look like carbon fiber playing along with the black and white theme of the car. The Chrome wheels with the VW emblem echo the VW pride, VW owners know all too well. Even the name of the exterior color, “Candy White” invites you to the sass and fun these cars are associated with. It has all the updates we are spoiled with today, that ironically was at one time not part of the Volkswagen promotion. In the 1960’s almost every third car on the road in West Germany was a Beetle. That is some pretty dramatic data. Somehow the people of Germany had put away the ugly history upon which this car was conceived. It was developed in the shadows of the Third Reich. (For a very interesting read visit the Fast to Create site in which Jessica Grose gives us a look into the cultural giant’s history.) We all know the tragic stories of the German camps. The factory plants were right in line with these tragic stories and the lack of humane treatment imposed by this dark force. Yet out of this darkness, light emerged and the car continued to wash off the soils of the past, and came into it’s own light. It became its own symbol of peace and love. In the 1950’s VW starting selling the Beetle here in the U.S. They played up ads that promoted the car with phrases like “Think Small.” This was appealing to the hippie culture who wanted to break away from the materialism associated with other car makers. Ad ons were considered unnecessary. The Beetle was simplistic and humble. It embodied “Peace and Love.”It was part of a cultural shift. In 1998 the Beetle was re-introduced. The public embraced the familiar beloved cars of the past, so much so, there was actually a waiting list to own a “Herbie” or a “Punch Buggy.” If you are old enough, you know the game. The beauty of these cars is that they are universal to all economic status. Here in Jupiter I may see the same person that drove their Bently by yesterday, drive their Beetle by today. I researched the Beetle to try to pull some interesting content that related to the one we have in inventory. We have sold a few Beetles already, some from the 70’s, and the newer models. Everyone has driven away happy. I wonder if many people really know of it’s dark past as they drive around in them. I know I will not look at them the same way. I still love them, just differently now. I see them like a kind of symbol, an example that we can heal after horrific things happen. Learning of its dark past, it reminded me of my high school literature class. We would read pieces of novels and Shakespeare plays and the teacher would ask us what themes were highlighted in the piece?”Good Conquers Evil” was my go to theme and it was right every time. That’s what I see now as these cars roll around, Good Conquered Evil, and Peace and Love have triumphed. I think it’s cool to own a car with that message.